The Cruisair MTD is a modular chiller engineered for optimal use of the new environmentally safe R-410A refrigerant. 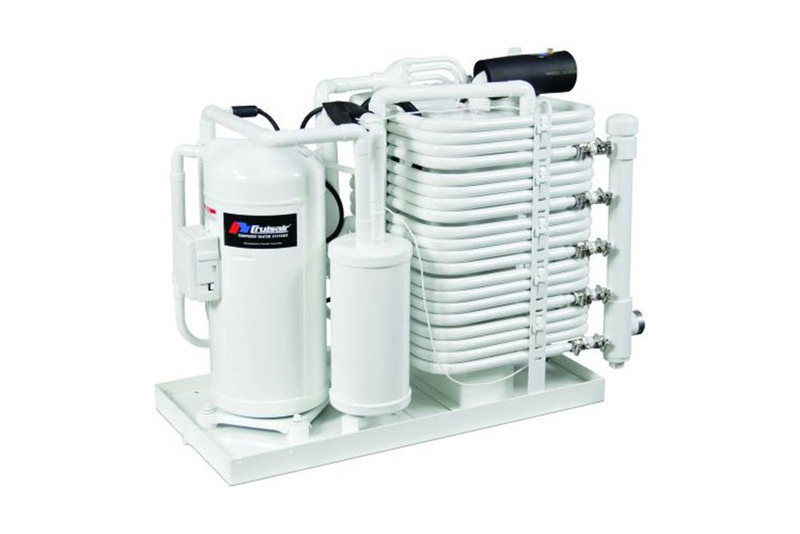 This tempered-water unit provides installation flexibility, reliability, maximum performance, and easy accessibility for maintenance and repair. Flexible hose improves alignment for customer connections, and all seawater connections are reinforced with stainless-steel for added strength. Thermal expansion valves optimize performance over a wide range of conditions, while a hot-gas bypass valve maintains heating performance in cold seawater and helps prevent water freezing in the heat exchanger. With heating performance effective in cold seawater temperatures as low as 38°F (3.5°C), the need for separate fossil fuel or electric water heaters is eliminated in most applications. The MTD is available in capacities of 24,000 to 120,000 BTU/hr (2 to 10 tons), and you can use multiple modules in any combination to achieve the total desired capacity. Custom frame and water-manifold installation for multiple units are also available. A reverse-cycle unit, the MTD provides reliable cooling and heating.